The Coopered Tot: The Macallan 12 - the archetype of a sherried malt still delivers - and how. The Macallan 12 - the archetype of a sherried malt still delivers - and how. 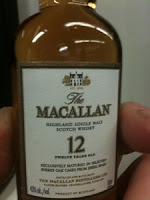 Before I understood what single malt was; how it differed from blended scotch, I owned a bottle of Macallan 12. Top shelf at every liquor store in the City, it was "the fancy scotch" pure and simple. Later on, when my whiskey snob persona was developing I knew it was sherried and a single malt. I called it "toffee walnut ice cream" and tried the 18 but stayed with the 12 as a value proposition. I always had a bottle. Somehow over the last decade, as I have wandered far afield I left Macallan alone and it's been years since my last dram. To reconnect I came by the prettiest miniature I've ever seen: thick glass, proper shape, and a real cork. 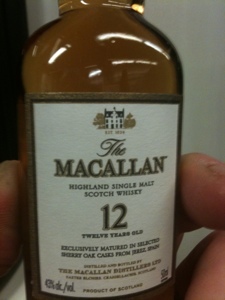 Now that I've been drinking a lot of top shelf hooch would the ubiquitous Macallan 12 stand up? If you drink it you already know the answer. Nose: Sweet with sherry. Somehow doesn't do it justice...wait - SHERRY! That's more like it. With time there's more: nutmeg, sweetmeats, toffee, baking sweets and baking spices. Under all is a bedrock aroma of rich elegant malt whiskey. This is a first rate nose. Entry is toffee sweet with an immediate burst of citrus. Creamy sherry blooms in mid-palate in full vinous detail with rancio, wood, spice and grape must. There's rich malt too, and spirit heat. Creaminess ushers in the finish which is all about emerging wood tannins which bring a crisp oak bite that doesn't dislodge the sherry. The sherry hangs on. 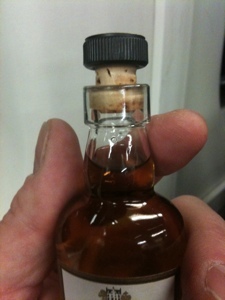 The finish is of medium length - par for 43% abv. At the fade out there's a lovely hint of smoked fish. With extensive air the rich sweet of the toffee sherry combines with the citrus opening and oak tannin finish to form lovely dark chocolate flavors too. This is so satisfying on so many levels, but I'm hard pressed to separate my liking for this dram from my deep sense memory connecting this flavor with malt whiskey's DNA at the deepest level. Recommended? A staple; more like an archetype. Conclusion? Same as it ever was - toffee walnut ice cream on steroids with refined wood and malt to boot. Those jaded years didn't make me look down on this classic dram. Quite the contrary, actually. I have a new found respect and admiration for it. It's the real deal. Funny enough, I've got one of these minis sitting in the cabinet. I had this last summer before I had had any malts except for Glenlivet 12, and I still was expecting good scotch to be available for the same price as good bourbon, so I was kindof disappointed that I wasn't wowed more. Now that I'm sensitized to the price of scotch, I think I might be more open to The Macallan 12, which I've had a few times and is really quite good. I am kicking myself for paying a steep price for the miniature ($9 and change in a small store in NYC). A little more than 4 times that and I could have had a whole bottle with 15 times the volume. I should have remembered I enjoyed it. Frankly I'm surprised I enjoyed it as much as I did. Seriously though, I've been through that debate in my head a few times, and I can never seem to reach a good consensus on when it's OK to spend $10 on a miniature vs. the full bottle price. You have to weigh the wasted money on the fact that it's just fun to taste some new whiskies, and it'd take you too long to do it if you only bought full bottles. Luckily though my Macallan mini was only $5, and that's pretty much always worth it! actual effort to produce a very good article… but what can I say… I hesitate a lot and don't manage to get nearly anything done. Thanks, Paddy. As it turns out, that sample was a bit of dusty. I'm going to do a follow-up to this post where I taste a very new bottle, and a 1990s dusty old one and compare the differences. There have been some barrel management changes in recent years.